Come volunteer! 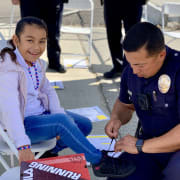 Join Operation Shoes That Fit LA put new shoes and smiles on 237 children, April 29, 2019. This event will take place at Main Street Elementary School. Dress Code: Comfortable sneakers and clothing you can lift and bend in. Bring water to keep hydrated. Bring ID - We will be on school grounds.